MHARF is extremely grateful to have received a donation from the Estate of Mary Lee (“Marly”) Whiting. 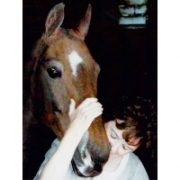 Marly was an animal lover, dog trainer, and accomplished horsewoman who showed American Saddlebreds throughout her life. How very kind of Marly to remember MHARF in her estate planning so that many more equines will continue to benefit from her generosity! We also want to thank her Estate Trustees, Roberta Cole and Sheryl Juhl for all of their assistance! You can find Mary Lee Whiting’s full obituary HERE. The first ever Hold Your Lady Tight Night at the James Ballentine Uptown VFW in Minneapolis on 03/31/18 was held as a benefit for MHARF and it was a big success! Thank you so much to event organizers Morgan and James and to everyone else who helped and came out to support us! Horse Crazy Market 2017 a Great Success! Thank you so much to Jeanne Klein and everyone who helped put Horse Crazy Holiday Market on! MHARF had a great time, met and visited with many great people, and raised a lot of money for our programs! MHARF raises close to $9,000 on Give to the Max Day! Give to the Max Day was on November 16th, 2017. On this day of state-wide giving MHARF was able to raise almost $9,000 with the help of our wonderful supporters. Thank you! MHARF Tack Sale in November Our Most Succesful Ever! It is with very heavy hearts that we report the news that long-time MHARF friend and advocate for horses Scott Mork has passed away. On 09/01/17 Scott lost his courageous battle with cancer. Our hearts go out to his wife Melissa and the rest of his family and friends. 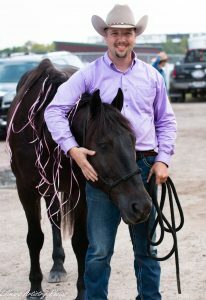 Scott had been training the young mustang Monte over the summer for our Promise of the Future Training Competition. He viewed this as a chance to do something meaningful for a horse during the time he had left. Monte acquired a whole team of fans who continued with his training when Scott could not do so. The “Scott Mork Team” presented Monte at the competition on September 16th in honor and memory of Scott. MHARF was honored to present Scott posthumously with our annual Good Horsemanship/Good Sportsmanship Award. We want to offer out heartfelt sympathy and say thank you to all of Scott’s family and friends. 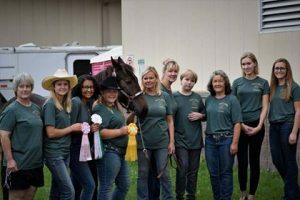 MHARF held the 10th Annual Trainer’s Challenge of the Unwanted Horse on Sept. 16th, 2017, at the Leatherdale Equine Center on the U of M St. Paul campus. The event also featured the Promise of the Future Training Competition for Young Horses. Both competitions were a great success! You can find all of the final results and the photo galleries by using the links below. Thank you! Thank You to our 2017 Trainer’s Challenge Sponsors! For the complete sponsorship list and links to their websites please Click Here! MHARF Trainer and Horse Featured in Four News Stories! 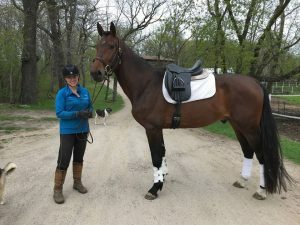 Morganne Reinboldt and Radin, her 2017 MHARF Trainer’s Challenge horse, were recently featured on both KWWL and KCRG News in Iowa and in the Cedar Falls Courier and Cedar Falls Gazette. MHARF is proud to have Morganne and Radin as representatives! 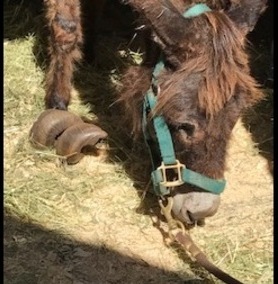 MHARF’s newest intakes are Seven Donkeys who came from a Pine County, MN, humane case. This is a recent and ongoing case so please check back for updates. You can read the FOX 9 News story by clicking Here! 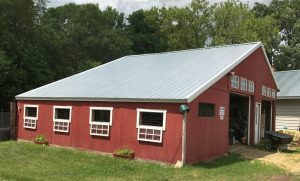 This spring MHARF was able to replace the roof on one of our barns with the help of a generous donation from the Doug and Louise Leatherdale Foundation. This barn has large stalls that we use to foal out mares who are pregnant at intake. It is also used for intensive care cases. 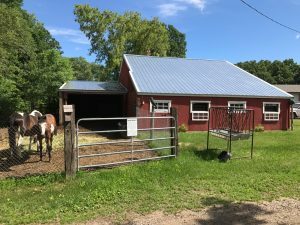 This new steel roof will keep horses safe and dry for many years to come! Thank you to the Leatherdale Foundation! 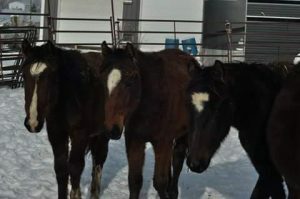 MHARF Horses Featured in ASPCA Article! MHARF horses Sally Forth and Patriot were recently featured in an article from the ASPCA to celebrate the organization’s national Help a Horse Day! Sally and Patriot were among the horses transferred to MHARF from the ASPCA (American Society for the Prevention of Cruelty to Animals) after a large humane case in North Carolina. 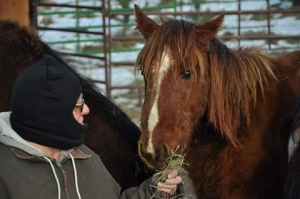 You can read all about it here: After a Life of Neglect, Two Horses Transition from Terrified to Trusting. Read several great articles by Debbie Griffin published in the Princeton Town & Country paper! One is about long-time MHARF supporters Marlyn and Lauren Hempel. The other is an article about MHARF. Click here to read! On January 9th, 2017, MHARF sadly said goodbye to long time resident Sven the sheep. 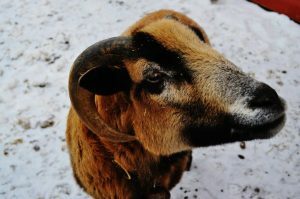 Sven (who was born in October of 1999) came to MHARF as an orphaned lamb. He has been entertaining visitors to the farm for 18 years. Sven was humanely euthanized because of failing health due to old age. He will be greatly missed! CLICK HERE to see the full details of this story! Help a Horse Day Update: Unfortunately we were not awarded any of the grant money from the ASPCA for our Help a Horse Day event. However, we thought it was a great day for all involved. Thank you to everyone who supported our event! 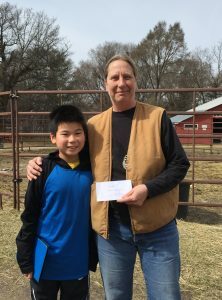 Last month, JJ, 11, of San Francisco, presented a check for $2,000 to the Minnesota Hooved Animal Rescue Foundation. For the past six years, JJ has been visiting Minneapolis and riding KT Scarlett O’Hara, a sweet-tempered Arabian who was adopted in 2008 by his aunt, Sue Ann. Moved by the story of Scarlett’s rescue by MHARF from a hoarding case involving 23 Arabians and a donkey, JJ was determined to help MHARF. To raise the funds for his donation, JJ sold his gently used clothes and toys, collected recyclables, saved his allowance, and solicited contributions from friends and family. One of JJ’s favorite activities while in Minnesota is to visit the animals on the MHARF farm. When he grows up, JJ would like to work with animals, designing and building mechanical limbs for horses and other creatures with missing limbs! Thank you JJ–you are amazing!